We win tomorrow and we go ahead of Sp*rs and United into 3rd. From here it becomes about defending 3rd place, not about playing catch up. Look at those red dots from their last 5 EPL results - their collapse is on! Interestingly we actually only need a draw to go into third. Pretty bloody important that we win this one though. One of the easier games in our remaining fixture list. Some absences - Koscielny, Xhaka out, Aubameyang on the bench. Good win that. Newcastle are pretty good defensively, and Rondon is dangerous, but we didn't give them a sniff for a minute. Sorry that's a bit of a sh*tty table snip but you get the gist! Spurs are in free fall and still have Europe as a distraction. United have to play City again and have Europe as a distraction. Chelsea do not look convincing at all regardless of who they play right now. We have a couple tricky away fixtures but really should be hammering home this advantage now. 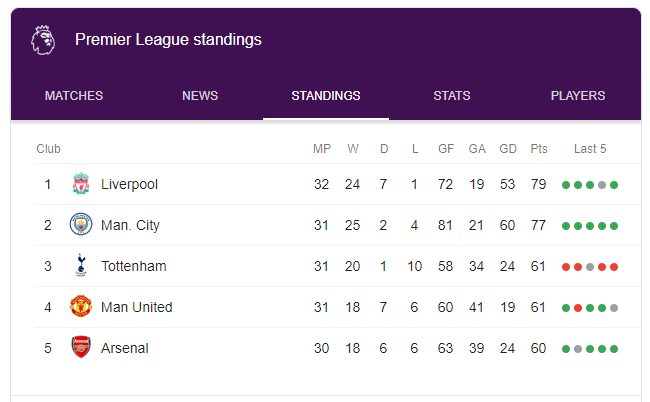 Also our goal difference is much better than United's and Chelsea's so providing we don't go and lose by 5 to someone or they go and win one or two games by 5+ then that is almost worth an extra point. Solid with moments of spectacular today. Plenty of times when it looked a bit 'routine' given how well Newcastle shut us down but we did keep opening them up. On Ramsey's first goal if the teams are reversed and Sokratis goes down there I'm convinced Taylor wouldn't have blown it up. On Lacazette's goal disallowed I'm unsure why the keeper got protection there? He came, wasn't strong enough, and missed out. He was impeeded only on the basis of multiple players in the mix competing - not because people were holding him back. Hopefully Ramsey limping out isn't serious, he was outstanding once again. How good is ozil looking now... That was his fourth consecutive start, first time starting that many in a row this season... Emery's message has gotten through? Last night was my last live game of this nearly seven year stint in the UK. Ironically, my first game was against Newcastle around Christmas in 2012. We won 7-3 and Theo scored a hat trick so it was quite nice to finish with them as well. Thought I'd go through some of my live Arsenal memories. I'm lucky enough to have a good mate who works for the club and I get access to his season tickets with some regularity. Best game I've been at live was the NLD at the Emirates last year where we won 2-0. Through work I had managed to wrangle a ticket in the Emirates Corporate box which as you can imagine is pretty well situated in the stadium and we were epic that day. Mustafi kept Kane in his pocket all day and we bullied them all over the park. Strangest experience was being at the Cologne home game last season where thousands of their fans showed up and were spread throughout the stadium. Odd being in a line to get into the stadium and a German song breaks out around you. Then when they scored to go 1-0 up early a whole pile of people round us throw off their Arsenal beanies and jump to their feet to celebrate. Was a fun night! Now just the occasional trip the Ring of Fire awaits, and I'm bloody excited about it. If only for the ability to purchase a decent pie and not the Cheese and Onion rubbish I had to purchase last night. Gooner 4 Life, kwlap, ajc28, brumbys and 1 other endorse this! Gooner 4 Life, kwlap, ajc28, brumbys, and Surge endorse this! And actually on last night. I thought a few players looked a bit rusty, especially Kolasinac for the first 60 minutes or so. He just seemed a step or two behind a lot of the time and passes were just a bit off. Some of our link up play in and around the box was absolutely delightful and Ozil had the bag of tricks well and truly open. When you're there live it is funny to watch how he reacts when someone isn't quite on the same page as him.There was one pass he played to Aubameyang late in the game that in the ground you could see the ball literally bend to meet the run of Auba, it was beautiful stuff. We really did play some nice football in the last twenty minutes and probably could have had a couple more. It's hard to argue that our turn around in form hasn't coincided with Ozil's reintroduction. In saying that, a lot of our players have found form and it seems we're really starting to click. Those away games we have coming up do scare the living daylights out of me. Everton, Wolves and Leicester away are all the types of game that if you got a point out of in November you wouldn't be overly disappointed but given the situation I think we will likely need to win at least two of them. Hopefully Wolves win the FA Cup semi this weekend and the Premier League becomes a bit of a distraction for them. Fudgeing huge result for us at Molineux this morning!!! Nervous about the away games. Weird how the schedule works that 5 out of the last 7 games end up being away, but I guess that balanced out with a similar run of home games at some point (can't remember). Top 4 is in our own hands now which is all you can ask for rather than having to worry about multiple other teams results. paulm and brumbys endorse this! I'm not impressed with this schedule. Given we're still in Europe playing us again on the Monday after an international break, and then the following Sunday it unnecsarrily cramps up our mid week games and reduces our breaks in the tight period by exacerbating them in the lighter periods. It is what it is, but you'd think they'd be looking at player welfare and fatigue etc and putting some logic in place to avoid this happening. The Wolves game away, which is midweek, is only in this run because Wolves are in the FA Cup. That was supposed to be the weekend before the international break. Still not ideal I guess but just the way it tends to get at the back end of the season sometimes. It's crazy when you hear about proper old school seasons when teams were playing three or four times a week at the back end of the season because they still had a million cup replays and lots of games used to be called off because of the weather. Not ideal results this morning but the situation remains unchanged. Yea gutted no points dropped this morn, but as you say, nothing changes, we know what we have to do. Everton game is MASSIVE for us this weekend. We were absolute shark this morning. No Xhaka or Torreira in midfield is hurting us. Ozil showed why we can't justify his wages - he is useless in tough away games. Where is Koscielny? Away to Watford is now even more difficult with Sokratis suspended after his 10th yellow. I kept falling asleep during the match, but what i can remember it was pretty awful. Hopefully the team can just put this behind them and move on quickly. Still in our hands for now.